Physical servers and cloud servers work in the same way, except that cloud servers are at a remote place. The functions differ in a big way. In cloud server, the client pays rent for the virtual server space, whereas, in physical servers, they purchase the servers. Traditionally there are two main options for hosting: shared hosting and dedicated hosting. Shared hosting is the cheaper option whereby servers are shared between the hosting provider’s clients. One client’s website will be hosted on the same server as websites belonging to other clients. It is a combination of multiple clouds, say two or three. Their identities are separate but bound together. It enables companies to keep their critical applications in a secured way on dedicated servers safe from third party access. While the other not-so-critical applications are available on shared platforms. In a business environment, some resources are managed in-house and others are provided through external cloud. For example, you can host your e-commerce website in a private cloud. It is secure and scalable here. But their brochure with product details, store location, etc. can be hosted in a public cloud, where security is not much of an issue. This is more economical. 2. Cost saving as you need not pay for unused capacity. The use can be scaled as per requirements. So you get flexibility and scalability of VPS with security of dedicated hosting on the same network. 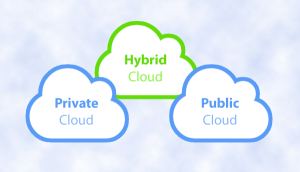 The hybrid cloud comes in combo of an internal cloud and one external cloud. A hybrid cloud is a cloud computing environment in which an organization provides and manages some resources in-house and has others provided externally. Hybrid cloud hosting is like having best of both the worlds. Agility and flexibility – in scalability, enables server capacity to scale up based on requirement. Non sensitive functions are moved to public clouds allowing scalability. Flexibility to add on software and firewalls. When additional space is required in the private cloud, the temporary requirement is met from the public cloud. This is called cloud bursting which IT organizations use to meet average overload. Value for Money – no huge investments and installation expenses. Pay for actual usage. A single data center takes care of multiple computing needs. Public clouds are centrally managed and offer economies in operating costs. Organizations take benefits of these savings. Self-manageable – since everything can be managed from a single control panel which is easy to operate. Overall high performance with security and speed of connectivity. Business organizations can balance their in-house computing needs and public cloud services. Due to the multiple benefits of hybrid cloud hosting, many small and big businesses have earmarked 2015 for shifting to hybrid cloud hosting. 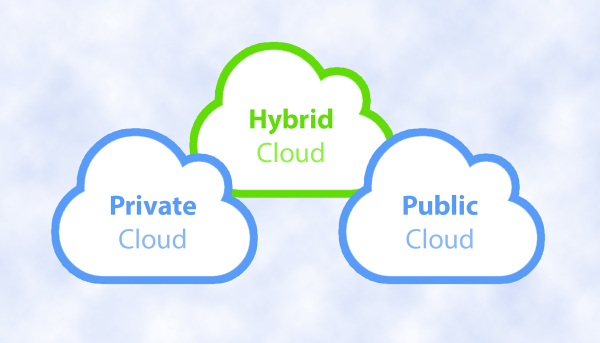 Hybrid cloud works in any combination of private and public cloud hosting on the same network. The sensitive data remains in the control of the business house using the private cloud. Due to its adaptability and versatility, hybrid cloud hosting is getting popular. It creates virtual shared accounts almost on dedicated servers. Hybrid hosting is most compatible with the existing systems, generally referred to as older systems. Governments, banks have huge data stored on the system and technology prevailing since beginning about 40 years ago. The data stored is very large and used when required. But these run on a set of hardware configurations. Any changes, howsoever minor, disrupts the whole working. To change this is a nightmare as any failure will create a chaos difficult to humanly handle. Hybrid hosting safely co-exists with the existing hardware. This makes government corporates and banks, etc. to move forward technologically with the old system designs. They cannot think of upgrading without the risk of losing the data stored over the years. There is a way where new clouds can be connected to the existing old servers and upgradation can be carried out gradually. Even then it is risky and will take years to migrate.